Sen. Graham Promises Investigation of FBI and Justice After Explosive Interview Former FBI Deputy Director Andrew McCabe told CBS and NPR that officials had discussed invoking the 25th Amendment, a procedure which takes power away from the president. Senate Judiciary Committee Chairman Lindsey Graham, R-S.C., has vowed to launch an investigation into whether officials at the Justice Department and the FBI were plotting a "bureaucratic coup" to oust President Trump. Sen. Lindsey Graham, the chairman of the Senate Judiciary Committee, has vowed to launch an investigation into whether top officials at the Justice Department and the FBI had plotted an "administrative coup" to drive President Trump out of office. Kevin Bishop, a spokesperson for Graham, tells NPR that no date has been set yet for a hearing. The senator, who was attending the Munich Security Conference in Germany, spoke with CBS' Face The Nation after an interview with former FBI Deputy Director Andrew McCabe aired on 60 Minutes. In what many are calling an explosive revelation, McCabe said he wondered if there were an "inappropriate relationship" between Trump and Russia, and that Justice Department officials had discussed whether power should be taken away from Trump through the 25th Amendment. He also said that Deputy Attorney General Rod Rosenstein personally offered to wear a wire to secretly record Trump after he fired former FBI Director James Comey. His remarks appear to sync with an anonymously penned New York Times opinion piece about "early whispers within the cabinet of invoking the 25th Amendment." 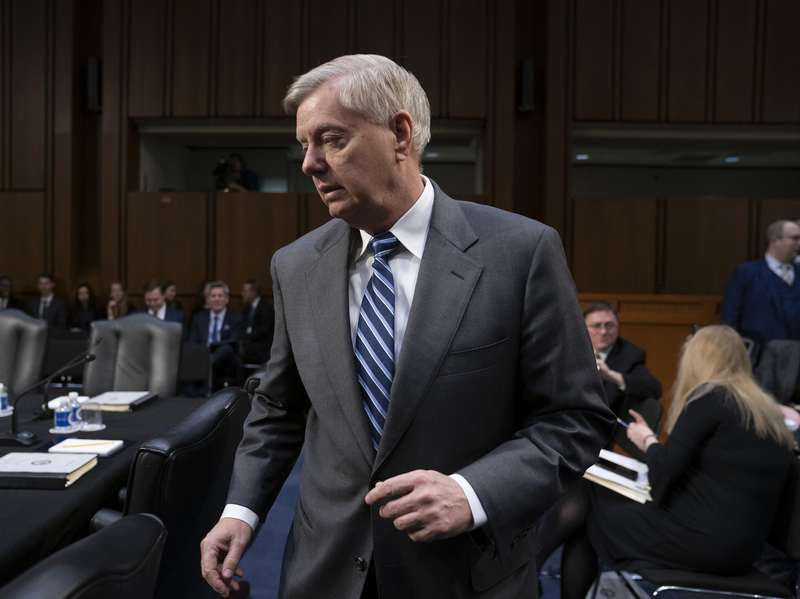 Graham questioned whether McCabe's admission amounted to "an attempted bureaucratic coup," saying the country needed the truth. "I'm going to tell the country about McCabe and the people at the Department of Justice and how they behaved," Graham said. "Did they take the law in their own hands? Did they abuse the FISA warrant process because they had a political agenda? Did their hatred of Trump go so far that they abandoned their role of being law enforcement agents and become advocates for a political cause? We're going to get to the bottom of that." He also said he would subpoena Rosenstein and McCabe if he had to. McCabe spoke with NPR's Morning Edition and said that he sought to halt accusations of an attempted coup. "At no time did I ever perceive that there was a legitimate effort underway by Rod [Rosenstein] or anybody else to remove the president under the 25th Amendment or in any other way," he said. He added that no one followed through with Rosenstein's alleged proposal to wear a wire. He described being "taken aback by the offer" from Rosenstein. McCabe said he spoke with "attorneys back at FBI headquarters about it. We all agreed it was a horrible idea and it was not something that we would pursue." Rosenstein has denied that he suggested wearing a wire. Long before William Barr was sworn in as Attorney General last week, questions have arisen over just how long he will remain employed by the Justice Department. He is expected to stay through a transition period and a concrete timetable for his departure hasn't been determined, NPR's Phil Ewing reports. As for McCabe, a grand jury was impaneled last year to consider his case after the Justice Department's inspector general determined that he misled investigators about contacts with a Wall Street Journal reporter, as NPR's Carrie Johnson reported. It remains unclear whether he will face criminal charges. Referring to the inspector general's investigation, McCabe said, "I don't believe they were independent or fair in the process of this investigation or in its result." He was fired hours before being eligible to collect his pension and health benefits. Trump said on Twitter that McCabe's "story gets even more deranged." But he appeared to believe McCabe's description that Rosenstein offered to personally wear a wire, saying the two men "look like they were planning a very illegal act."